Four house building site managers have been awarded the title of NHBC Pride in the Job Supreme Award winner at a ceremony held in London. Now in their 38th year, the awards organised by NHBC, recognise and reward a site manager’s dedication to achieving the highest standards in house building, and their commitment to building homes of outstanding quality. The Supreme Award winners were announced at a black-tie event hosted by television personality Paddy McGuinness. Nigel Smith from Darren Smith Homes won the Small Builder category for St Paul’s Lock, Mirfield. Stephen Walker from C G Fry & Son Ltd was named as the Medium Builder category winner for his site in Poundbury, Dorset. Kevin Gosney from Lendlease Construction (Europe) Ltd took the Multi-storey title for managing Phase MP2 H2 of Elephant Park in London. Paul Mclachlan from Taylor Wimpey North Yorkshire was crowned the Large Builder category winner for his management of the Morley Carr Farm site in Yarm. 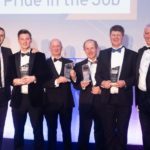 Commenting on the Awards, Steve Wood NHBC Chief Executive, said: “NHBC created ‘Pride in the Job’ almost 40 years ago with a clear vision of promoting and driving the very highest standards in new home building for the UK’s homeowners. Now, in 2019, this vision remains as strong as ever and is very much at the heart of the competition and at the centre of everything NHBC does.